The Black Jew Dialogues combines fast-paced sketches, improvisations, multi-media, and audience participation in an attempt to tackle one of the biggest issues of past, present and future generations: prejudice and multiculturalism. The comedic play came to FIU on Wednesday, April 6, during Diversity Week and was staged before an audience of more than 50 students. The play involves two characters, Ron Jones “The Black” and Larry Jay Tish “The Jew,” from two different cultures. The duo traces the history of the American Black-Jew experience to the present day. “To deal with who we are, we have to deal with who we were,” said Jones. The play recounts historical moments when Blacks and Jews have to come together to survive slavery and immigration to the United States, to gain respect and advance their races in a racist society. 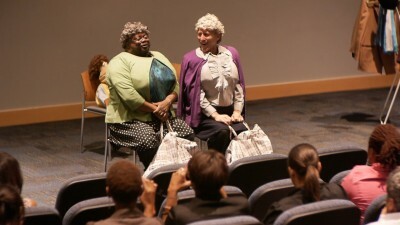 Jones and Tish are critical of the use of humor as a façade for discussion of difficult issues. They asked the audience to open their minds to see the world clearly through other’s eyes. By poking fun at their own cultures and themselves, the performers challenged the audience to analyze the mentalities of society, about how seemingly harmless jokes can, in fact, be hurtful. “Just keeping it real,” Tish says mockingly. Tish eventually apologizes to Jones, because he realizes how hurtful his words were. Jones and Tish poke fun at the stereotypes of Jews and Blacks by describing them as “Feareotypes,” one of numerous terms the duo invented. One “feareotype,” for example, happens when we lock our doors while stopped at a red light and a homeless person approaches. This race topic is so tiresome. It’s just a hate whitey rally. Please move on. I think this is a great start for people to learn how to apologize to others and also forgive. The world cant live with all this hatred “an eye for an eye makes the whole world blind” we need to leave all the wrong doing behinds and move on with life. Great article to read and a very touchy subject. Florida’s finest at its best yet again! It’s really no wonder why enhabitants of more advanced city structures regard South Florida as a third world country. This grade school rendition of “sticks and stones may break my bones” by supposively adult minds makes no attempts to address the real issues found in our culture. Poor transit systems that primarily help residents of low income housing travel to and from only other low income housing areas within perhaps the most clearly outlined segregated communities our country has to offer is perhaps a start in the correct train of logic to solving this problem. If minorities are not lucky enough to be hired purely based on the color of thier skin in an attempt for companies and government sponsored agencies to derive quotas for equal opportunities as opposed to actually housing thier places of business’s within black communities in an attempt to drive up economic value of both housing, schools and other institutions could possibly be another good start. (of course you’ll be disregarding this due to the clear lack of whatever you idiots call grammar these days, sorry i didnt feel like paying an editor to revise it).